WeTour "Experience Romania like we do!" 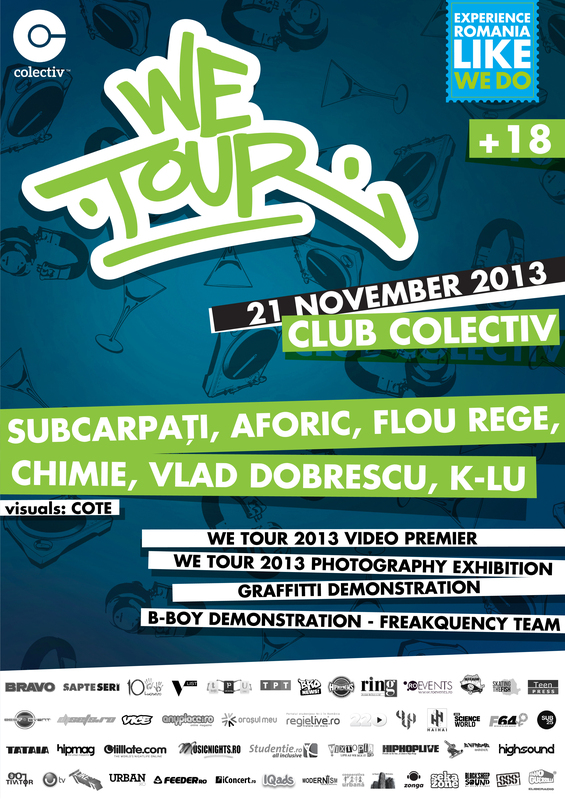 On the 21st of November 2013 , from 21:00 at Colectiv, you are invited to view the official We Tour 2013 movie premiere, by Mihai Bivol in an eclectic mix of urban culture that combines : oldschool hiphop , photography exhibition , breakdance, graffitti, film and underground folklore. So artists, stylers , riders and urban culture enthusiast , get your swag on , cause WeTour Crew is in the house ! Aaaaaaait! We Tour means promoting urban culture in authentic Romanian landscape, gathering every edition riders and followers from various areas of underground expression. We Tour Party takes place in club Colectiv, the freshest place in Bucharest, has the determination to bring the standards of Romanian nightlife at the level of the main urban hubs in Europe. That sets a new standard in terms of quality including concerts, parties , exhibitions and night happenings, in a former shoes factory. For those of you who are visually-developed, Colective will host a photo exhibition with professional photographies taken by participants of the WeTour ( 4:44 Film & Photography, 360view etc.). Come along with us at the party and assist in awarding the WeTour Champions !